2008 was a busy year for convective weather events and rare atmospheric optical phenomena. On here is a wide range of subject matter, some of it non-weather related which sums up the best events of the year from my area of N. Ireland. Thunderstorms, funnel clouds, rare Moonbows, floods, Noctilucent clouds, severe winds, and even astronomical events which include an attractive planet conjunction to end the year - 15 reports. This is a two page image account with 36 images and 2 video clips covering the period between November 30th and December 1st 2008 when a spectacular triple conjunction took place in the SW evening sky. 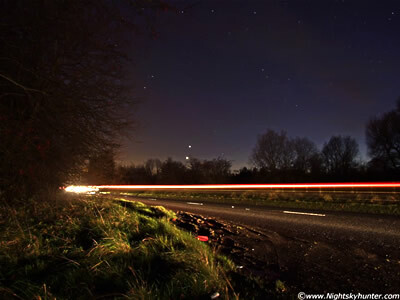 A crescent Moon joined Venus and Jupiter who where only 2 degrees apart. The following day the Moon occulted Venus. During twilight the planet emerged from behind the Moon making for a breathtaking conjunction. I managed to get clear skies on both days and imaged the event from a high location from a frosty Maghera. - PAGE 1, PAGE 2. After several nights of planning I felt confident that Oct 15th and 16th 2008 would provide the perfect conditions to hunt for the elusive moonbow. With a waning full Moon combined with Atlantic showers the sky did not disappoint. 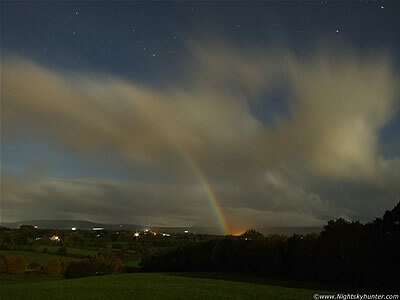 On both nights I captured Moonbows from a location outside Maghera over looking the Sperrin Mountains. 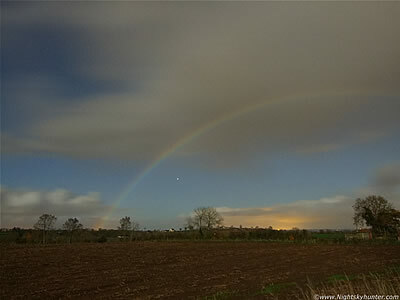 The incredible Moonbows were bright and colourful against a back drop of moonlit convection and stars. Two page report with 14 images. - PAGE 1, PAGE 2. 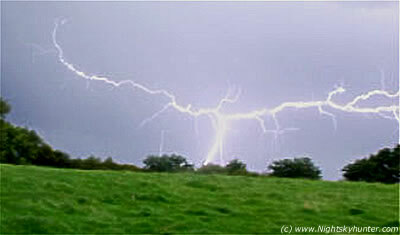 The first day of September 2008 got off to an explosive start with a risk of thunderstorms over N. Ireland. I spent much of the day imaging the action near Maghera where 4 or 5 storms arrived delivering high quality cold air convection and deadly C-G and I-C lightning and dramatic thunder, which at times was too close for comfort!. Two page report with 27 images and 1 video clip. - PAGE 1, PAGE 2. Severe weather has been effecting many parts of Ireland/N. Ireland between August 11th and 16th. This came to a climax on Saturday August 16th when 24 hours of intense rainfall caused severe flooding to many areas causing major disruption and damage. 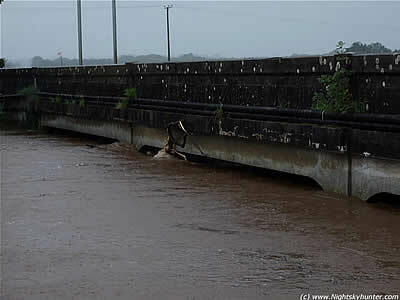 Between Maghera and Tobermore the famous Moyola River experienced what is being described as 'The Great flood of 2008' by local anglers. I was at the scene to record this historical weather event. Report with 16 images and 1 video clip. - REPORT. 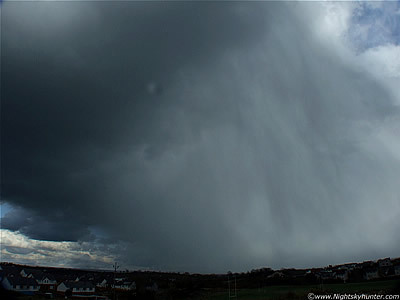 An exciting day on August 13th 2008 when a long duration thunderstorm formed over the Sperrin Mountains and slowly drifted over Maghera producing many cloud to ground strikes and intense rainfall. It also dropped three funnel clouds, one of which was large and tilted under the storm base in a horizontal position making this the best daytime thunderstorm I have seen this year to date. Two page report with 24 images and 3 video clips. - PAGE 1, PAGE 2. 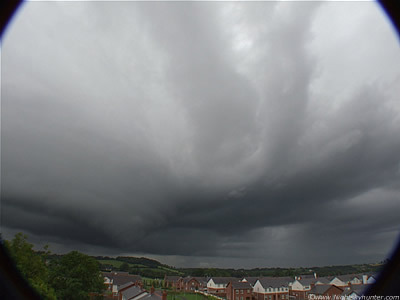 Monday August 11th was the beginning of several days of severe weather over N. Ireland which caused severe rainfall, floods, and disruption to roads. Taking advantage of a convective outlook I headed out to the Maghera countryside hoping to catch a storm. I was not disappointed. 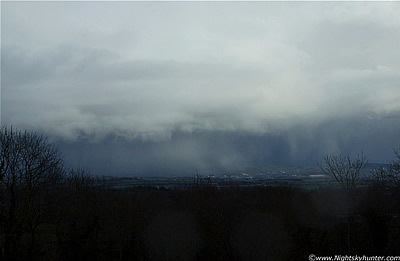 The most impressive Gust Front I ever seen arrived over the Sperrin Mountains and formed a stunning Shelf Cloud along its leading edge. This was followed by severe torrential rain, a nasty thunderstorm, and flooding. This report documents that evening. 21 images and 1 video clip. - REPORT. Second image account from August 2nd 2008 detailing another day of convective action. 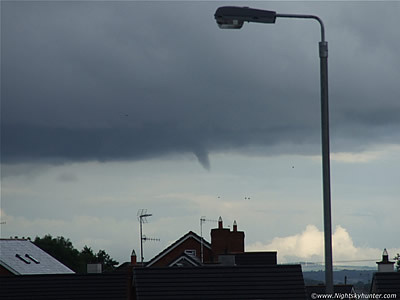 After a long day of shooting Cbs and towers in the Maghera countryside I returned home, however before 19.00 BST I glanced out my bedroom window and saw a substantial funnel cloud rotating in the eastern sky reaching half way to the ground outside Maghera. This account describes the day leading up to this thrilling event. Image report with images 7 and 1 short video clip. - REPORT. Things couldn't get better on Friday 1st August 2008 after a great partial Solar Eclipse and funnel cloud over Maghaberry. A convective outlook had been issued followed by a tornado discussion from TORRO. Later that evening I was caught off guard when the sky darkened over my home. A black menacing structure blocked out the Sun. Further observation showed that this monster cell had a huge area of rotation, wall cloud, striation rings, and inflow bands. The cell contained an obvious Mesocyclone making this a good case for a possible LP Supercell. Two page report with 24 images and 1 video clip. - PAGE 1, PAGE 2. 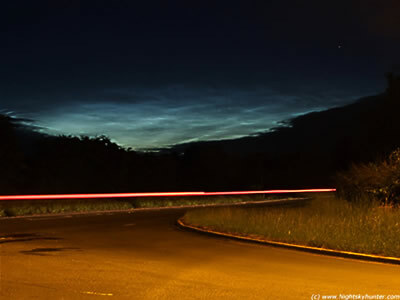 This is the direct link to the Nightskyhunter Northern Ireland Noctilucent cloud gallery featuring a selection of NLC images covering all active NLC seasons from 2005 to the present year. - GALLERY. July 18/19th 2008 was a night of unexpected thrills. I was out doing some night time photography hoping to catch an NLC display or even a thunderstorm however none of these exciting events took place. The sky however has a mind of its own and can present you with something unexpected and special. 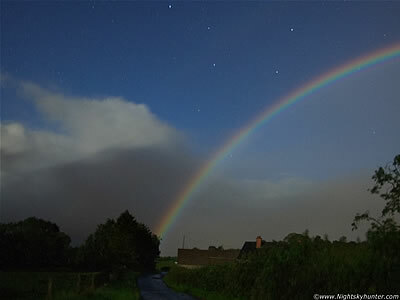 Between 01.30 and 03.00 BST I was fortunate to witness half a dozen very rare moonbows. These were the best I have ever seen my life with intense magnitude, colours, and even secondary and supernumerary arcs. Some twilight convection shots are also included. Report with 10 images and 1 slide show. - REPORT. 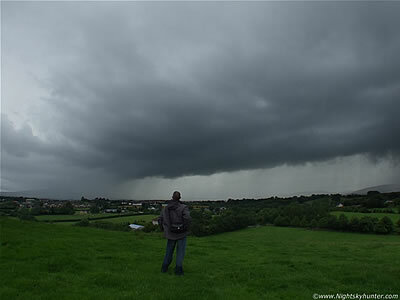 After a succession of hot muggy days in N. Ireland a violent thunderstorm crossed the country taking forecasters by surprise on May 8th 2008. 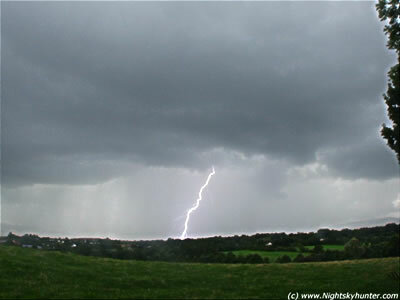 It hit the Mid-Ulster area at 03.00 BST and produced severe c-g lightning and long duration thunder for 1.5 hours without any let-up. I was fortunate enough to have been up and observed the entire event. One page report with 4 images and 1 video clip. - REPORT. Before sunset on April 27th 2008 I caught my 2nd T-storm of the 2008 season when a slow moving series of cells approached over the Sperrin Mountains from the SW. This storm produced one I-C flash and two spectacular C-G bolts and thunder less than one mile from me. 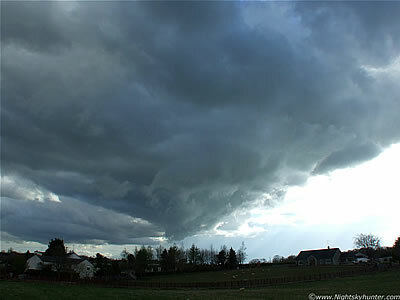 This was also one of three cells which showed rotation and produced heavy rain and hail. The structure of this storm was exceptional and so was the pink and blue colours cast by the low Sun. Inflow bands where observed also. Two page report with 20 images and 1 video clip. - PAGE 1, PAGE 2. The 2008 thunderstorm season got off to a good start on April 11th 2008 when I experienced my first brief thunderstorm of the year. The large cell produced the biggest hail storm I have ever witnessed to date over Maghera with stone sizes varying between frozen pea and marble in diameter which hurt on impact. 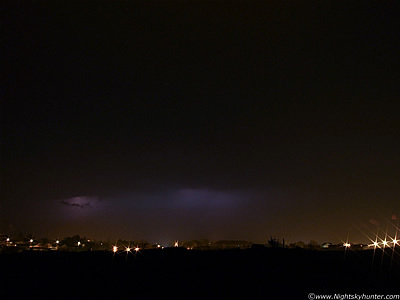 This was followed by gust front over the town which produced rain for hours on end. Report with 11 images and 1 video clip. - REPORT. On March 3rd 2008 a mass of cold polar air descended over the UK creating some good convection, snow and even lightning which knocked out the power many times. During the afternoon Conor Mc Donald and I observed the action from the countryside. What began as a hopless day turned into a great success when we caught large cells, giant snow and a menacing gust front. Two page report with 16 images and a video clip nearly 10 min's in duration. - PAGE1, PAGE 2.